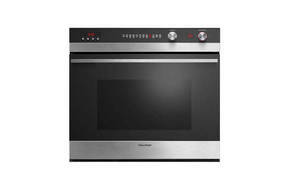 Snapshot: The Fisher & Paykel OB76SDEPX3 single oven has pyrolytic self-cleaning. But how did it perform in our test kitchen? Has a smokeless grill tray. Visibility through the oven door is OK.
Beeps when preset temperature is reached. Has three sets of telescopic runners attached to the shelves which can be easily moved to other shelf positions. Mostly glass exterior is easy to clean. Telescopic runners can be fiddly to clean.